You want your vehicle wrap to stand out but not be too overwhelming to the eye! A vehicle wrap is a brilliant form of mobile advertising that has the ability to reach out to a wide and large audience. It quickly and effectively advertises your business to anyone that sees your vehicle, all thanks to the vehicle wrap on it. Because a vehicle wrap has the ability to reach such a humongous audience, you will want to make sure it is well designed. To do that, make sure you follow the do’s and don’ts of designing a vehicle wrap for your business. Incorporating color into the design of your vehicle wrap is an important tip when trying to grab the attention of others. By picking bold and exciting colors, it will be difficult to not take notice of it. 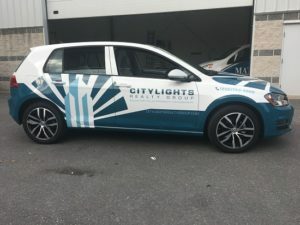 By utilizing color in such an effective manner, you are making the vehicle wrap on your vehicle memorable and keeping your business present in the minds. Thus, making it an effective design technique to boost your marketing efforts. The last thing you want your vehicle wrap to be is overcrowded and over complicated. If you go overboard with the design, you will be making it difficult to convey the message to your audience. You will want it to be colorful and eye-catching, but with a simple and memorable design. Otherwise, your wrap will be too noisy and overwhelming to be effective. Your client and their needs are what matter most when designing a vehicle wrap. A vehicle wrap can be great for a small business by helping their advertising needs, and it is exactly those needs that you must meet since they paying you to design the vehicle wraps. Make sure to keep your client happy and you have their final approval once your design is finished, otherwise, you will need to keep trying until they are satisfied with the vehicle wrap you have designed. Designing vehicle wraps digitally is great for its own reasons, but relying solely on it can prove to make things quite difficult for you and your client. Digital templates are useful when dealing with the dimensional outline of a vehicle, but fail when it comes to specific customization made to the vehicle. This entry was posted on Friday, September 21st, 2018 at 10:25 pm. Both comments and pings are currently closed.